The March issue of the KAA Sunflower Auctioneer is now available. 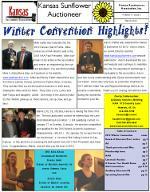 Content includes highlights from the 2012 Winter Convention, a letter from President Lance Fullerton, an article from NAA CEO Hannes Combest, 2012 Livestock Competition coverage, committee lists and more. Download your copy up from the members section.